One of the training companies I used did provide a form of the game known as Jeopardy. It was cobbled together in Excel, and it helped immensely in the classroom. It kept people engaged, and really made the participants flip through their manuals to quickly find the correct answers. The good part was that it did the trick; the bad part was that it was cobbled together in Excel. Raptivity is a fun, powerful tool that will enable you to breathe new life into your training initiatives. With it you can access a library of ready-made games, and then customize and publish them for use in your training -- all without ever writing a single line of code! In fact, the entire application is wizard-based to make it easy to get started. Of course, if you prefer to get down to the bits and bolts, the Interactivity Explorer interface enables you to point and click your way through the customization at a much deeper level. If your organization uses a Learning Management System (LMS), you can also track game play and score results. Raptivity is fully compliant with SCORM and AICC to track and integrate with all leading learning management systems. You can track completion status, scores and responses. 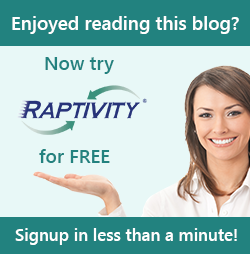 Getting started with Raptivity is remarkably quick and easy. After launching the application, you choose a library of games and then select an individual game to customize. Your ability to change the look and feel of each game is pretty good. Games me co-branded, you can change the instructions, the size of the screen, icons, thumbnails -- almost everything can be updated within the simple application. The quality of the games provided in the libraries is quite good and consist of good graphics, audio and interactivity. The animation is excellent and will keep player's attention. This is half the battle, and Raptivity does a good job of engaging players. Games range from familiar childhood favorites like Hangman to more elaborate Jeopardy and Wheel of Fortune motifs. If you are a training consultant, or if you work with a corporate training or HR department, and are looking for creative ways to enhance your in-house training efforts, I think Raptivity will be of tremendous interest and value to you. Because the finished games are published in Adobe Flash, you can use them as standalone games on laptops or your network or publish them an Intranet or to the Internet for wider distribution. You will be pleased to know that Raptivity games may be played across a wide variety of platforms including online and on a variety of mobile devices including popular tablets and mobile devices such as Blackberrys and Androids -- any device that supports Flash. To download a demo and see more examples of Raptivity in action, please click here.